My days are all sorts of off. Each one is more of the same – unpack, beach, unpack, beach. I made a pact with myself – when I start my new job on Monday I will have no regrets about not spending my time off wisely. I have no doubt that my new position will be a challenge, include a huge learning curve as someone new to food service management, and be demanding, in a good way, of my time and energy. And it’s a good thing Monday is coming quickly because I am sensing that it could be very easy to lose my groove completely and slip into an early retirement at age 27. Another reason the days are all running together is they’ve all been the same: HOT and HUMID. I am fairly intolerable to the heat. My lower back will start sweating at 80 if I move too much. Considering we’ve been in the 90’s and 100’s and without any sign of rain, this has made for perfect beach weather. Mr. Prevention and I are QUITE the scene heading to the beach with Lily and in our aqua shoes carrying beach chairs on our backs and beach towels around our necks, donned in all of the neon bright beach colors. SPF 40’ing one another has become a routine activity. 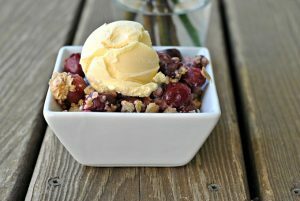 I debated on whether or not to even post this recipe thinking, “This is a no-brainer that I would probably zip right over in my Google Reader” but, no. It is worth every last effort to spread the word of its wonder. 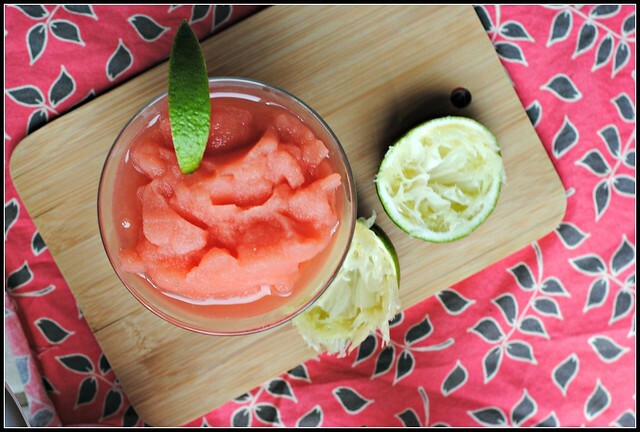 Between watermelon and slushes, there’s nothing that could bring any more cool summer delight to my mouth or belly…and for the small price of 82 calories! Mr. Prevention and I fight over the blender for the seconds and thirds, and even he claims watermelon isn’t one of his favorite fruits. Of course you could substitute in just about any fruit with this, but there’s something about the super sweet and summery watermelon that has me loyal and steadfast in my fruit slush selection for now. Maybe when the heat breaks, I’ll break my streak. Even after the beach, the air-conditioned house (keep on cranking, HVAC that-is-of-age-to-break!) feels so good and all I want is something sweet, cold and refreshing…like a Watermelon Slush. Blend all ingredients in a blender until smooth. Serve immediately. Result: Beyond refreshing! 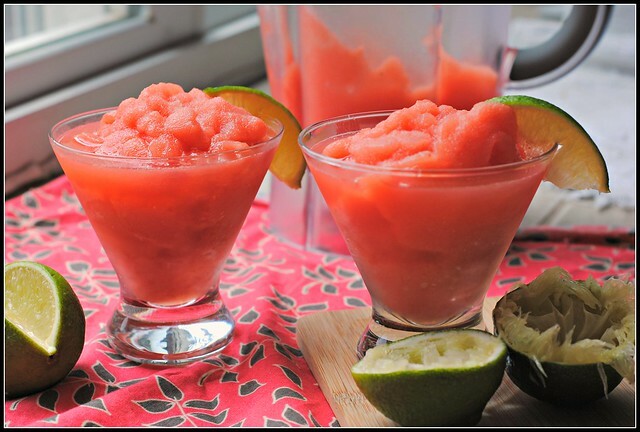 I thought I would like this slush and was more or less just using up some watermelon that I had frozen for smoothies, but this was absolutely delicious and sooo refreshing. This is officially a summer staple. You can easily turn this into happy hour treat with a few shots of tequila or vodka in the blender 😉 Enjoy! Whatever is on tap this weekend, stay cool, refreshed, and hydrated. Lily and I will be at the beach, soaking up every last minute and being sure we have thoroughly broken in every last raft and inter tube we are now collecting in our garage. Monday and this back-to-reality business will be tough…probably more so for her than I. If Lily was spoiled before my last day of work on July 15th, she’s simply rotten after these 3 weeks of fun and action! Can we see a pic Lily at the beach? Of course! http://www.facebook.com/photo.php?fbid=10150938684302670&set=a.383549232669.167662.240089322669&type=3&theater – I don’t know if this link will work, but on my blog’s Facebook page there’s one 🙂 It’s been so hot, I haven’t wanted to risk damaging my camera! 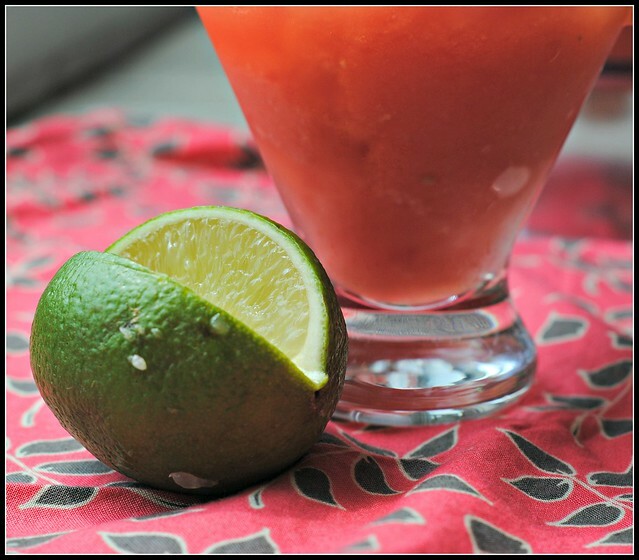 I love lime and watermelon together – this looks great! Ohhhh I absolutely feel your pain on the heat and humidity. We’ve had a heat index of nearly 100 for the last week and since we’re just now in July we’ve got about 2 more months of that to look forward to. I *hate* the heat and find it so ironic I’ve live in Florida as long as I have! I think soaking up beach time before your job is the best way to go! This looks fabulous!! I love the short ingredient list! YUM! And you should take advantage of this mini break that you’ve had. I would totally do the same!! This is actually making my mouth water! 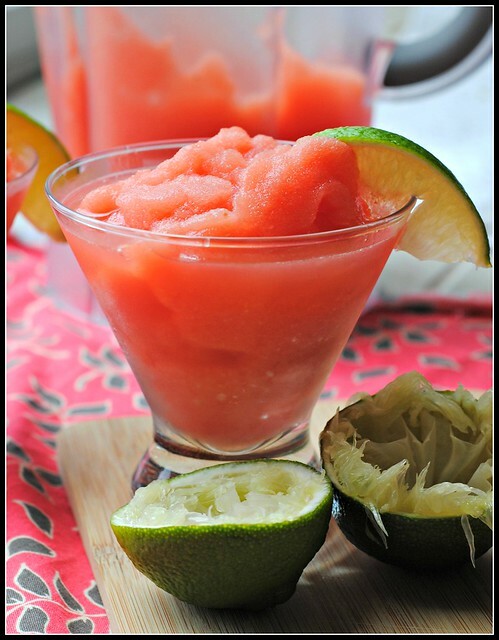 I am in love with watermelon and this slush looks like the perfect way to cool off! It reached 100 degrees today! Mmmmm, these sound refreshing and a great way to cool off from all that beach time!! Good luck with the new job on Monday, you are totally going to rock it! 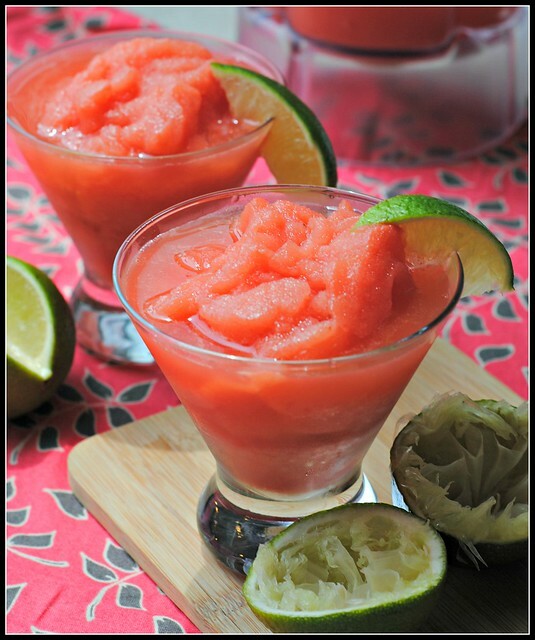 I made and posted a watermelon lime slushie almost identical to this a couple weeks ago and thought the same thing but it is definitely SO worth it 🙂 There’s nothing more refreshing in the summer heat! 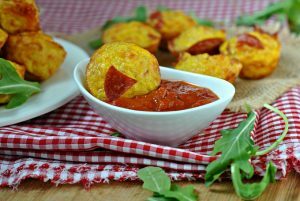 I am glad that you didn’t skip over this recipe – sometimes the simpler recipes end up being the best ones because you can make them easily with what you have on hand. I tried a similar flavor with a juice recently; this slush looks so refreshing. Thanks for sharing! Congratulations on making the foodbuzz Top 9! Wow, this looks amazing, I have been dying to try freezing watermelon and blending it, your photos are making me add watermelon to my grocery list! It’s delicious! It blends up perfectly if you leave it sit out at room temp just a bit before blending…enjoy! This looks so refreshing! I think I would just climb into my refrigerator and close the door if the temperatures got over 90!! I not comfortable much over 75 degrees! But I’m not going to wait for a hot day to try this watermelon slushie. I may make it tomorrow! Many congrats on Top 9!